As soon as Chanda and Munda were laid low and many of the battalions of the demons where destroyed, mighty Shumbha, with intellect clouded by rage, commanded the mightiest of his warriors and the biggest of his armies, to march forth ready for battle. When Devi (Ambika) saw the massive army advancing, she filled the space between the earth and the sky with twangs of her bow-string, her lion roared & even louder roared Kali suffusing all other sounds in the universe. The army of the enemy surrounded the lion, Devi Ambika and Kalika from all four sides. Meanwhile, Devi Shaktis from the bodies of Brahma, Shiva, Guha, Vishnu and Indra, issued forth, endowed with exceeding valour and strength, to join the battle. Whatever was the form of the Godhead, whatever his ornaments and vehicle, in that very form his Shakti advanced to fight the demons. 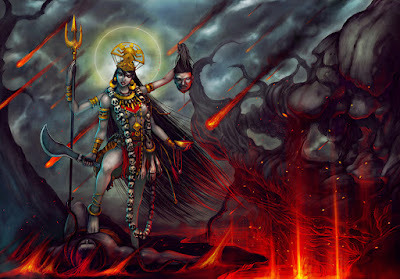 Lord Shiva, surrounded by the Shaktis, asked Devi Ambika to kill the demons for his gratification. On the command for the lord of the universe, the fiercest form of Shaki emerged from the goddess. She was called ‘Chandika’. The invincible Chandika, asked Shiva to go as her ambassador to Shumbha and Nishumbha, and ask them to either let Indra obtain the sovereignty of the three worlds or come forth and fight her till death. Since the Devi appointed Shiva himself as her ambassador, she came to be known as ‘Shiva-duti’. The demons refused to surrender and the battle between the Shaktis & demons began. Kali tore the foes into pieces with her spear and mashing them with her skull-topped staff. Brahmani left the enemies bereft of valour and prowess by sprinkling holy water on them from her water-pot. Maheshvari slew the demons with her trident, Vaisnavi, with her discus, Kaumari with her lance and Aindri with her thunderbolt. Varahi, wounded in their chests by the point of her tusk and Narasimhi devoured the demons with her claws. When the troops of the enemy saw their fellow warriors been killed so effortlessly they took to their heels & vanished in no time. Noticing the fleeing demons, the great demon Raktabeeja came forth to fight. Raktabeeja was attacked by all the Shaktis, but the army only grew. No sooner did a drop of blood from Raktabeeja’s body fell on the ground, than a great demon of his very stature would spring forth on the earth. As many drops of blood fell from his body, so many demons with his valour, strength and prowess came into being. Soon, the world was pervaded by thousands of demons born out of the blood of Raktabeeja. The gods were baffled and turned to Chandika for help. Chandika was amused and asked Kalika to open her mouth wide open and savour the blood that drips from her weapon that slays Raktabeeja. She told Kalika to devour any demon that was born of the drops of blood of Raktabeeja. Chandika then struck Raktabeeja with her spear & Kalika drank every drop of blood that ran out of Raktabeeja’s body. She also devoured every new demon born out of his blood and those that lay dead on the battle field. Soon the profusely injured Raktabeeja lost all his blood in the fight with Chandika and fell on the ground lifeless. Raktabeeja is symbolic of the ‘Chitta vrittis’, or the incessant compulsive thoughts and desires. Raktabeeja has this unique power that whenever a drop of his blood falls to earth, another demon of identical size and strength springs up. This is also the nature of incessant thoughts or desires. Each thought or desire leads to another. Though the gods are bewildered by the ever-multiplying ‘Chitta Vrittis’, the Devi only laughs knowingly. Is it better to conquer one desire by nipping it in the bud or to satisfy a thousand desires? Desire makes us human but it is also the source of all suffering. Conquering the original desire will release us from this endless cycle of desire, gratification, disillusionment and frustration. The way in which Kalika kills the demon is symbolises how controlling thoughts and desires at their onset can liberate us.